ABINGTON, Pa. (Reuters) - The U.S. military faces a challenge recruiting people with the high-tech skills it needs for the future as those who joined after the Sep. 11, 2001 attacks leave the service and the U.S. economy creates more jobs, Defense Secretary Ash Carter said on Monday. 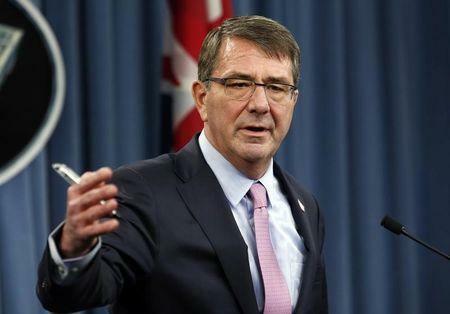 Carter, in a speech at his former high school, said the military has to attract about 250,000 people a year just to keep up with those who retire or leave the service to pursue jobs, education and other opportunities in the civilian world. At the same time, only about a third of the 21 million Americans age 17 to 21 are eligible to join the military, with half unable to pass the entry examination and the rest ineligible because they are unable to meet the physical fitness or character standards, he said. He urged young people to consider joining the military noting that while the sacrifices were real, there were great opportunities as well, including up to $284,000 through the GI bill to help pay for college. "No one should gloss over the hardships and danger," Carter said, "but I do want you to understand how fulfilling and rewarding military life can be." Carter's speech at Abington Senior High School north of Philadelphia was part of the secretary's effort to spark a national discussion on what the Pentagon needs to do to build a future force that can maintain U.S. military superiority. He is looking at steps like easing age restrictions on enlistment for certain specialty jobs like cyber and challenging the military services to consider innovative approaches to advancement, including promoting based on performance without regard to time in a military rank. Deputy Defense Secretary Bob Work is leading a companion push to identify the technologies the Pentagon must develop for the U.S. military to maintain the edge that has enabled it to dominate potential rivals for 70 years. Carter told the high school students their facility with technology made them particularly suited for the military of the future. "You've grown up using technology as second nature, which has probably helped you learn more than any prior generation about all the opportunities that life can offer," Carter said. Despite Carter’s concerns, the military met its recruitment goals during the last fiscal year, as it has in previous years. The military faced some recruitment challenges during the height of the surge in Afghanistan but was able to attract more people with financial incentives.